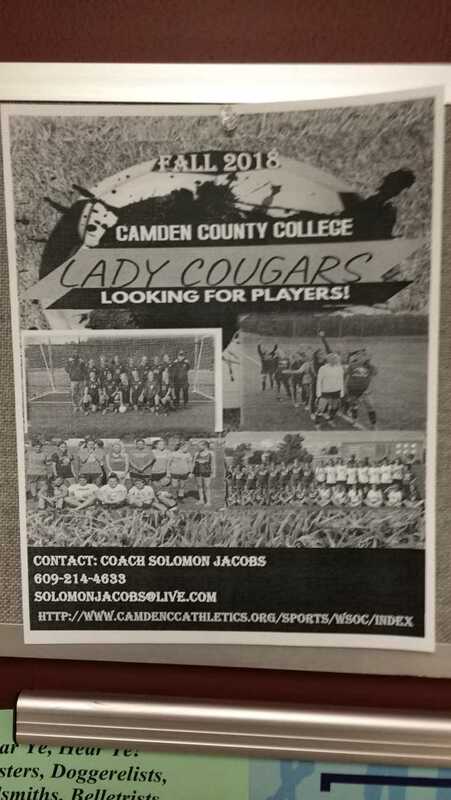 BLACKWOOD – The Camden County College Athletics Department has hired a new women’s soccer coach and is seeking to form unified sports teams. “Unified sports/basketball is not a Camden County College collegiate team. We are just looking into the possibilities of hosting some unified sports programs for our students and community,” says William Banks, the director of athletics at Camden County College. According to specialolympics.org, unified sports is an initiative designed for social inclusion through shared training and competition experiences. It was founded in 2008 and is funded by the U.S. Department of Education to use Special Olympics to build inclusion and tolerance around schools across the country. The department has also hung flyers inviting women to join the women’s soccer team. Camden County College recently acquired a new head coach after Jim Gallagher retired after 17 years of coaching. “The new head coach, Mr. Solomon Jacobs, wants to make sure that any female students who would be interested in trying out next year for the women’s soccer program knew who to contact and also for recruiting purposes for mid-year transfers this current year or possibly students that didn’t know we had a women’s soccer program,” says Banks. Jacobs has been working on his coaching degree after being in the U.S. for approximately 15 years. He’s originally from Africa and since being in the U.S. has had experience coaching other soccer teams in high schools around the country. Jacobs says he’s excited about giving new life to the team and making the team a more known presence to the Camden County College community. Team member Kate Bannan, a freshman at Camden County College, says although the team is small, the players have a strong bond with one another and have fun together. Despite the size of the team, she says she’s excited a few new players decided to join the team after Jacobs was hired. “I love Solomon. He’s such a skilled player,” Bannan says.